It was a solemn undertaking. Around 400 members of the public trooped around the haunted gallery of Hampton Court Palace, quizzically testing the air to see if they could sense the restless spirit of Catherine Howard. Her screams, it is said, can be heard on the dark English winter nights, echoing across time from the moment she tried to break free of house arrest, accused of pre-marital infidelity, certain of her fate. She hoped to find Henry VIII and reason with him: secure her head on her shoulders for a while longer. But knowing what we now know about Henry it was the slimmest of chances. It was Dr Richard Wiseman of Hertfordshire University who staged the exercise – more than a decade ago, now, in 2001- to test whether the dramatic falls in temperature in the gallery were real or imagined. To probe people’s feelings of uneasiness and find reasons for them. Thermal imaging cameras were installed, and the visitors asked whether they felt a ‘presence’. A few visitors obligingly saw apparitions and felt temperature drops, but the psychologists were able to explain every one away. At 6am, though, there was an unexplained event. The cameras picked up a figure. It was unmistakable. And it was moving purposefully about the gallery with a familiarity which was unnerving. The pulses of the researchers raced. Was this it, at last? Proof, finally, that ghosts exist? And then the figure drifted over to the cupboard and got out the vacuum cleaner. I’m sure I need say no more. Proof of ghosts; ghosts and proof. We have been trying to validate the supernatural for a very long time now. If we really did catch a proper ghost on camera: would we accept it? When I was working in a haunted mansion, years ago, I heard a story which involved one of the most haunted parts of the house, the studio theatre which used to be a nursery: the scene of a tragic fire in which two children were killed. One night, as the house was about to be closed up, two staff did a final check of all the CCTV cameras. And there, outside the studio theatre, pacing up and down in a strangely disjointed way, was a man. One, a manager, feared this might be someone who had had a couple of pints too many. Keep an eye on the cameras, she said to the lady at the box office. I’ll go and sort him out. But when she got there, there was no one there. She turned to the camera and radioed down to her colleague: where’s he gone? Yet the colleague, downstairs, could still see him. He was pacing up and down with that strange jerky gait, in precisely the same place as the manager, who was clearly unable to see the apparition. It’s a tale. But this folklore that cameras can pick up things we do not see: it persists. 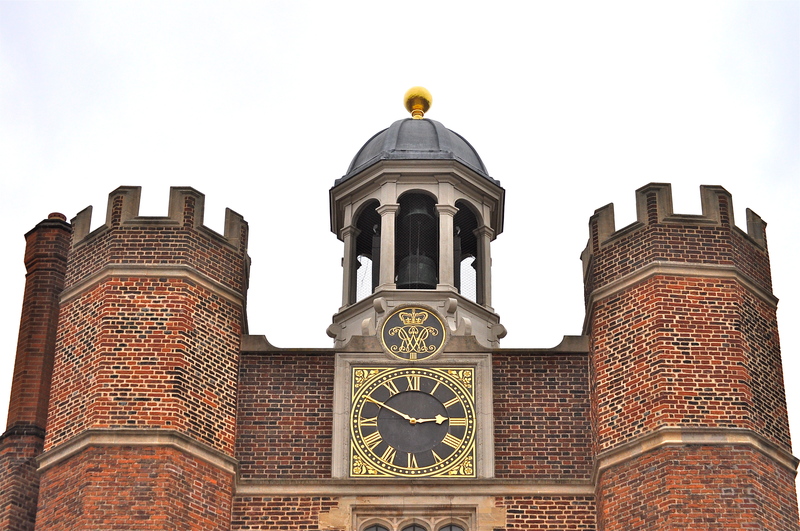 Tomorrow, we head to Hampton Court Palace. And I shall be looking carefully, not at the haunted gallery, but at a set of double doors near the Clock Tower Square, the grand main entrance to the palace, usually thronged with visitors. The story goes that some time in October 2003, for three consecutive days, staff were called to check a double fire door near the opening exhibition. It was swinging wide open. The first day the cameras showed the doors fly outwards, with nothing to show what had caused it. The same happened on the third day, with the doors slamming shut immediately afterwards. But the second day: that was a different matter. There are many that wander that palace in period dress. But the Palace cameras picked up no-one entering or leaving the vicinity around that time. According to the security cameras, this place was deserted. Yet it must be staged. Posted in Places to visit, Spine ChillersTagged Dr Richard Wiseman, ghost hunters, ghosts, Hampton Court Palace, Henry VIII, supernaturalBookmark the permalink. This is the same realm as religion. You believe or you don’t believe. 😀 I love that, Roger. Fear has a way of making anything possible, if just for a short time. I think I shall plead agnostic on the issue of ghosts, I have no proof one way or the other so I shall continue to enjoy the stories and the excitement they generate. Will wait for the update after the actual visit. I am not sure if cameras can actually pick up the activity or ‘ghosts’ but it sure is an interesting realm that always generates curiosity. It does. It’s probably nothing. But today, when I talked to staff about the incident and the double doors, their eyes sparkled. A ghoul in period costume sure livens up life. Firstly, you’ve answered a question I’ve had as to who it was who mentioned a fire in a nursery where children died… I now know it was you! The question has been plaguing me for weeks. Secondly, having a ghostly visitor to Aqua Mansion switch on my music system when it wasn’t even plugged in and crank the volume up to the loudest level, I’m well aware that there is something ‘out there’. I’m not sure about this CCTV footage though. The ‘ghost’ seems a little too solid to me. Obviously, though, I’m the font of all knowledge when it comes to ghosts! Great post, Kate… and Happy Halloween! Good gracious, Tom! Not even plugged in! That’s Amityville-level intervention! My work at the mansion in question has showed me how easy it is to deny the existence of the supernatural, even in the face of overwhelming proof. We just don’t want it to be happening, so we blank it out and justify it in a thousand ways. I try to remain openminded about such things. There’s so much that we simply don’t know. More things in heaven and earth, Andra…loving your Halowe’en week posts, by the way. Superlative writing. Easy to be sceptical when the ghost takes a vacuum cleaner out the of cleaning cupboard, Tilly. Love pondering the possibilities, Kate. Ghostly visage . . . or staged acting? The “ghost” seems rather un-ghost-like . . .
With no one in the area. The staff there call it ‘skeletor’, Nancy. It’s a brisk old ghost with a practical bent, to be sure. BTW: If you want a different kind of challenge to focus on, you might enjoy this Halloween contest. If you win . . . 5 shiny new autographed children’s books for Big Al! Thanks Nancy – may give that a go! If you look closely, you’ll see she had a job getting them to stay, Celi 😀 I know what you mean about the outfit. A bit of decent make up wouldn’t have gone amiss, either. Ah, Debra, I know what you mean. These things conflict with our belief systems: how to reconcile them? There is a lady called Susan Howatch who wrote a series of totally compelling page-turners centred around Salisbury – known in the series as ‘Starbridge’ Cathedral. I couldn’t put them down because they managed to combine all my philosophies in one place. They were sensational at times: not always subtle: but I was bereft when I came to the end of her novels. Curiouser and curiouser, Kate. I eagerly await your post. I went along and- nothing, Penny. Not a ghost of an apparition. Great Tudor afternoon though. A good time was had by all. I wouldn’t discount it. I’ve never seen a ghost. I’ve gone out of my way to see one, but I’d probably have freaked if I actually did have an encounter. Catherine Howard would seem to be a logical choice to be hanging around. Her life was abruptly ended which means that she had unfinished business. Somehow that need to have another go at negotiating with Henry: that brought the full horror of this woman’s plight home to me, Judy. It is what I would have done, had I faced the axe. Surely, she must have thought, if I can just speak to him, I can change the course of events. Kate … Just so you’re aware. Your comment to me on “The Body and the Toaster” was sent to my spam folder. It might be that you have your e-mail address and your wordpress.com address on your link. I did unspam the comment. I do love your stories…There are people who see ghosts, whatever…I knew somebody once who saw a person in a pub in New Orleans and when she asked someone who it was and described the person she saw, they told her he was someone from way back. Every now and then someone sees him!!! Oh, definitely staged – if a friend of ours who worked there as a special security officer for some time are NOT to be believed. During that time he changed from an utter sceptic to a complete believer in the supernatural. He says it made their jobs rather too interesting to be chasing after things that weren’t actually there. That should read, ‘… if the stories of a friend of ours …’, of course. Unless you have had something happen to you, it’s easy to scoff and shrug it off, but I have had several strange occurrences that aren’t easily explainable. I believe something lingers on, emotions whatever. If your open to that possibility, you will open yourself to experiences. If you don’t believe, it’s not likely it will happen to you. I couldn’t agree more, Elizabeth. As someone who used to lock up an ancient old mansion at around midnight each night I firmly believe there are more things in heaven and earth than are dreamt of in our philosophy. You put it so well: it is personal experience which causes us to cross the rubicon and consider these events credible. I envy you and your access to all those beautiful, ancient buildings! I live in a remote part of Colorado, much different from you, though my family and I are from England. If its a 100 years, that’s old for here. I’ve always had an interest in whether ghosts are real or not and have had some interesting and frightening experiences but love English history, particularly Henry Vlll.